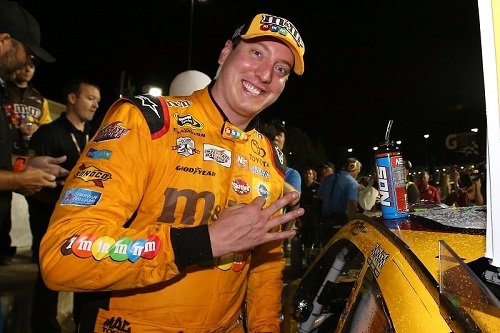 Kyle Busch celebrates a NASCAR Sprint Cup Series win at Kansas Speedway in May 2016 (photo courtesy of Getty Images for NASCAR). Nominees for the 2016 ESPY Awards were recently announced, and nominees in the Best Driver category include IndyCar’s Scott Dixon and Alexander Rossi, NASCAR driver Kyle Busch, Formula 1 driver Lewis Hamilton and NHRA’s Era Enders-Stevens. Not motorsport racer was nominated in any other ESPY category. The ESPYs are fan-voted awards, and fan voting for the 2016 awards is open through 8 p.m. ET July 13, the scheduled start time for the awards show to be held at the Microsoft Theater in Los Angeles. Only one vote is permitted per person, per category. Votes may be cast at ESPYs.com. The awards show, hosted by WWE’s John Cena, will air live on ABC.